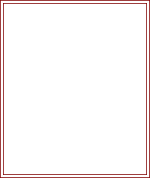 3dc Group. 3dc in same space or stitch. yo and draw through all loops on hook. Round 7 - Working in dc's not sc, rpt Round 6 once. Fasten off. Turn. Round 10 - ch1, 1sc in base of ch1, * ch3, skip 3dc, 1sc in space before next 3dc group, * rpt from * to * to last 2dc, ch3, skip 2dc, sl st to first sc on beginning of round. Turn. Round 11 - sl st in first ch3 space, ch3, 2dc in same space, work 3dc in each ch3 space to end, sl st to top of ch3 on beginning of round. Turn. Rpt Rounds 10 & 11 until fourteen 3dc group rounds have been worked in all. Fasten off. Turn. Next Round - Join in color 1, # ch1, 1sc in base of ch1, 1sc in each dc to end, sl st to first sc on beginning of round. Turn. Working in sc not dc's, rpt last round from # four more times. Bag Handles - ch1, 1sc in base of ch1, 1sc in each of next 13sc, ch75, (for handle) skip 20sc, work 1sc in each of next 28sc, ch75, (for handle) skip 20sc, 1sc in each of next 14sc, sl st to first sc on beginning of row. Turn. Next Round - ch1, 1sc in base of ch1, 1sc in each sc to end, sl st to first sc on beginning of row. Rpt last round twice. Fasten off. Finishing - Weave in any loose ends of yarn and trim. 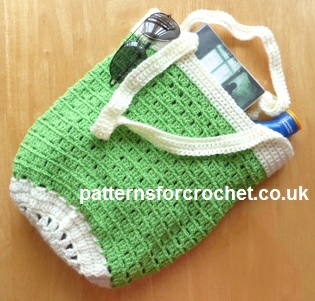 Hope you enjoy this free crochet pattern for a beach bag.